Winning Trap selects a trap number that won in previous race. It is particularly good for greyhounds races. If used for horses, it will select a horse by it’s position in the list on Betfair. 1. Separate by meeting – if this option is enabled, winning traps number will be taken from the last race of the meeting where current bet should be placed. Otherwise the trap number is taken from the last race in your race list, even if the race is on a different meeting. It would have more sense to enable this option and look for a winning trap in the same meeting. 2. Trap No. shift – adjusts number of the last winning trap by specified value. 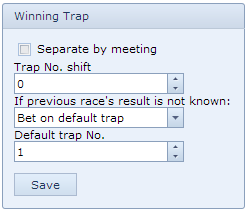 For example, if in previous race Trap 2 won and the shift is 1, the bot will select Trap 3 to bet. If the shift is -1 (minus one), the bot will bet on Trap 1. By default Trap shift is 0 meaning the bot should bet the same trap. If, for example, in previous race Trap 5 won and the sift is 2, the bot will select Trap 1 (5 + 2 = 7, but there are only 6 traps, so it goes around and 7 means 1). 3. If previous race’s result is not known – sometimes, particularly if ‘Separate by meeting’ is not enabled, there may be not enough time gap between two races and result of the previous race may be not known when it’s time to fire next bet. Then the bot doesn’t know which trap won and must handle this somehow. There are two options: Bet on default trap or Cancel the bet. 4. Default trap No. – default trap number which is used for the first race and for cases when previous race outcome is not known yet (if enabled in the previous option).